Murder by Gaslight: Cup of Affliction. If Mary Runkle was to be believed, she lived a life of sorrow, made all the worse by false accusations. Her “cup of affliction,” was filled with tragic deaths of three of her children and the suspicion that she was responsible. When her husband John died as well, under questionable circumstances, she lost the benefit of doubt and was forced to pay the price. Around 4:00 a.m. on the morning of August 19, 1847, 12-year-old Elizabeth Runkle frantically requested help from her neighbors in Oneida, New York, saying that her father, John Runkle, was having fits, and she believed he was dying. Messrs. Kirtland and Morgan dressed and quickly went to the Runkle house, but arrived to find that John Runkle had died. He was wearing in a clean white shirt, lying on the bed with his hands folded. His face was badly bruised. Runkle’s 50-year-old wife, Mary, was bruised as well. She explained that John had been ill and earlier in the night was taken with fits, got out of bed and fell on the floor two or three times, which caused his injuries. Her own bruises were from blows received when trying to assist him. A closer examination of John’s body revealed that he was bruised on the elbows, hips, and knees as if he had been struggling on the floor. His mouth was injured, and three of his teeth had been knocked out. Mary said she waited so long to get help because John threatened to kill her if she sent for the neighbors. On the floor of the bedroom were traces of blood that had been mopped up. A search of the house revealed a bundle of clothes, both men’s and women’s in a garret above the kitchen. They were moist and wet with blood and had tufts of male and female hair adhering to them. After a post-mortem examination, the doctors concluded that there was no evidence that John could have died a natural death. None of the marks of violence was sufficient to have caused it except those on his throat, where the traces of a thumb and finger were evident. The coroner’s jury concluded that John Runkle’s death was due to violence occasioned to him by Mary Runkle, with the assistance of Elizabeth Runkle. 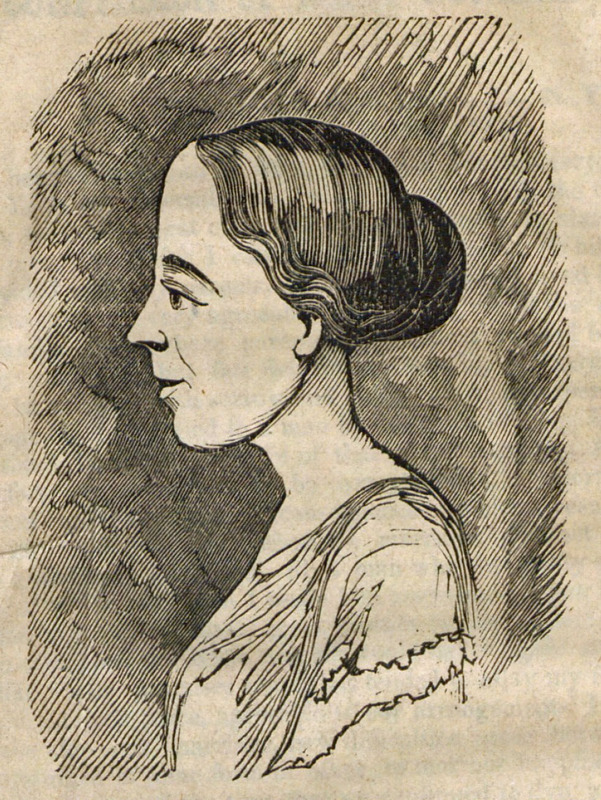 Mary Runkle was surprised and indignant that anyone would suspect that she murdered her husband, but as her history came to light it was clear that Mrs. Runkle was no stranger to crime and violence. During their years of marriage, the Runkles had relocated a number of times to escape suspicion of criminality. The first occurred in Root, New York, where Mary Runkle was accused of using a forged order to steal goods from a local merchant. While she was on trial for this offense, her husband stole two shawls from a public house. Both matters were resolved by settlement. Not long after, a peddler passed through the area, selling goods on credit. He disappeared before he could make his collections. Authorities tracked the peddler as far as the Runkles’ house, but could find no further trace of him. Two young daughters of the Runkles went to school wearing new dresses, saying their mother had plenty of such cloth. Repeating this to their teacher fed a growing suspicion that the Runlkes had murdered the peddler and stolen his merchandise. A few days later, the two daughters were found drowned in a shallow tub of water. Mrs. Runkle said that she had left them in the charge of her older son, but he did not supervise them. Soon after, the son died as well, of the measles, Mrs. Runkle said, but many suspected that she poisoned him. No charges were brought in any of these cases, but the Runkles felt it was best to leave town, and they moved to St. Johnsville, New York. Mr. Runkle purchased a tavern in the nearby town of Manheim. They decided that they needed cushions to furnish their new house and tavern. Mrs. Runkle was arrested for stealing cushions from a local church. The matter was settled out of court, and the Runkles moved again, this time to the town of Floyd, New York. In Floyd, the couple was suspected of burning a barn. They moved to Westmoreland where they were tried for perjury in a civil case. In Rome Mrs. Runkle was found guilty and fined for stealing two towels. 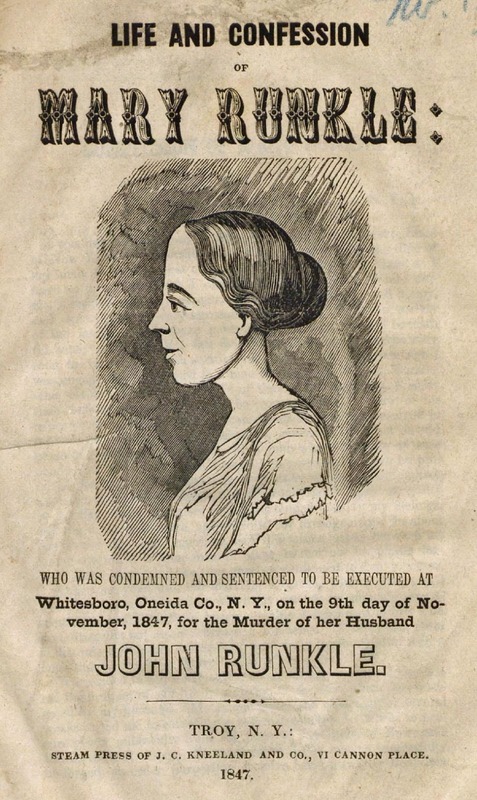 At the time of her arrest for murdering her husband, Mary Runkle was under indictment in Oneida for stealing clothes off a neighbor’s clothesline. 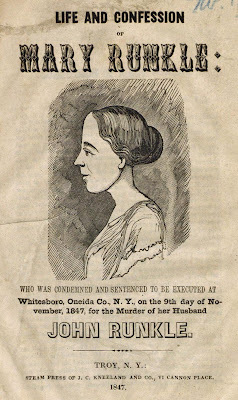 The trial of Mary Runkle before the Oneida Court of Oyer and Terminer was a straightforward affair. The State outlined the facts and presented the conclusions of the coroner and Mary Runkle told her version of the story. The case was given to the jury on September 21 and after deliberating for less than three hours, they returned with the trial’s only surprise. Most observers felt that Mrs. Runkle would, at worst, be found guilty of second-degree murder, but the jury found her guilty of first-degree murder, a capital offense. In the period between her conviction and her execution, Mary Runkle published her story in an eight-page pamphlet entitled Life and Confession of Mary Runkle. “My cup of affliction being full,” she wrote, “drugged with the bitterest draught of gall, has led me to reflect that I soon must die…I endeavored to breathe out my grief to the unheeded winds, and shed in silent the bitter tears that have been coursing each other from my streaming eyes.” But anyone expecting to read her confession to the murder of her husband, or to any of the other suspected murders, would be sorely disappointed. She stuck to her original stories—her husband died as a result of fits; her daughters died by accident when unsupervised; her son died of the measles; she knew nothing of the peddler’s death. She did confess to several petty thefts, but those crimes were committed, unwillingly, at the urging of her husband. She probably published the pamphlet in an attempt to engender popular sympathy. Her attorneys had petitioned the governor to commute her sentence. The governor was not moved. Jones, Pomory. 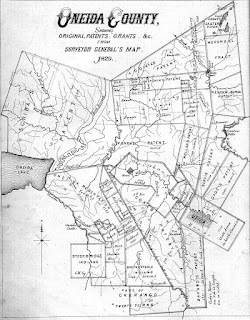 Annals and Recollections of Oneida County. Rome: Author, 1851. Runkle, Mary. Life and Confession of Mary Runkle . Troy: J. C. Kneeland and Co., 1847. "Execution of Mary Runkle." Age 19 Nov 1847. "Mary Runkle.." Cabinet 16 Nov 1847. "Murder in Utica." Albany Evening Journal 27 Aug 1847. "New Mode Of Hanging." Alexandria Gazette 15 Nov 1847. "Supposed Murder Case at Utica." Cabinet 31 Aug 1847. "Trial Of Mary Runkle." Commercial Advertiser 21 Sep 1847.
references keep being made to her living in "Oneida, NY" ("she requested help from neighbors in Oneida NY"). 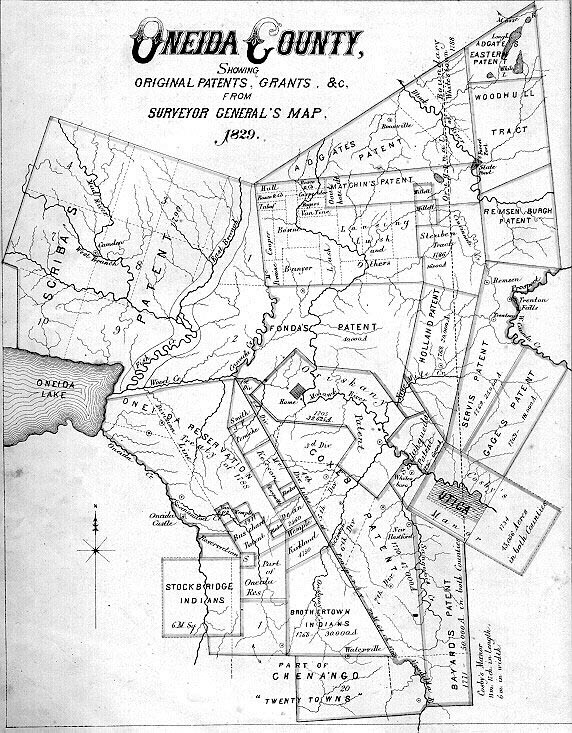 Oneida NY is in Madison County. The other places mentioned (Mannheim, Rome, Westmoreland and Whitesboro) are all in Oneida County NY, and the County seat is Utica NY. Unknown, I guess I should have said "requested help from her neighbors in Oneida County, New York"